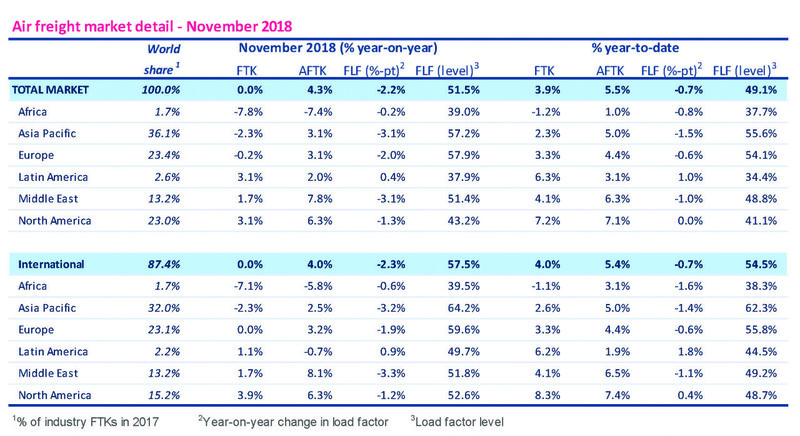 The month of November should be a peak time for airfreight given the run up to Christmas but there was only a modest change improvement through to November 2018. The demand for airfreight has slowed in the last few months but thus far this has not resulted in any significant change in lease rentals. Indeed, there has been no change traffic between November 2017 and November 2018 although for the first 11 months of the year, traffic grew by a modest 3.9 percent. According to IATA, the lack of growth for November represented a disappointment given the spurts of growth in some months in 2018. Yet November saw capacity seek to catch up with demand with 4.3 percent being recorded for the month and 5.5 percent for the first eleven months. The overall load factor has therefore fallen to below 50 percent for the year which represents a concern. Capacity inevitably takes time to catch up with demand but the danger is that operators seek to add too much too soon. With November failing to register an improvement, there is little to warrant an improvement in lease rentals or indeed adding additional capacity. There are still a good number of freighter aircraft waiting to be delivered. If capacity is evenly matched with demand, then this may mean that new aircraft or those freshly converted are acting as displacement rather than growth capacity. The cause of the stagnation in the airfreight is partly due to the issues affecting world trade. Asia/Pacific trade for example actually fell on November as did African traffic. There is every indication that this will not improve not least as Germany reports weaker economic growth along with other member of the EU. Where FTK = Freight tonne kilometers; AFTK = Available freight tonne kilometers; FLF = freight load factor. Rentals provided by The Aircraft Value Analysis Company Limited www.aircraftvalues.net, www.aircraftvalues.com.